Our world fell to pieces on 13 July 2006. After a series of infections, Rose was diagnosed with bone marrow failure. She was five months old. The next day we were admitted to Great Ormond Street Hospital. Our lives changed drastically from that moment. We had never spent a night away from Tara, our three-year-old. My husband Eoin and I were suddenly living on Lion Ward, the oncology ward, at Great Ormond Street. Luckily my mother moved into our house to look after Tara, but what a blow it still was for our little girl. On Tara’s first visit, she was so happy to be back with her family. It was heartbreaking for us to watch our two girls together. 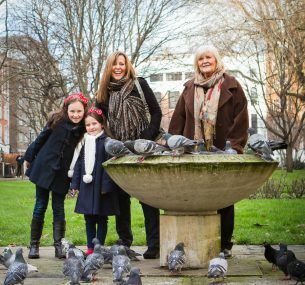 No-one had prepared us for how we would cope with missing Tara on top of our devastation at Rose’s diagnosis. A few days after Rose was admitted she had a Hickman line inserted. This was her second general anaesthetic in less than a week. The operation to fit the line into her chest followed a bone marrow aspirate and lumbar puncture. The line is used to administer chemotherapy and other medication, and to take and give blood. It was so frightening to see our little girl with these new attachments and heartbreaking to think of the pain she must have been in. We were told that Rose had infant acute lymphoblastic leukaemia (ALL), a form of leukaemia which is rare and difficult to treat. The doctors gave Rose a 50:50 chance of survival. Treatment for infant ALL is brutal. We watched our darling Rose’s body being pumped with steroids. We signed forms to consent to her being given toxic chemotherapy, knowing the hideous side effects that may follow. We had no choice. As Rose’s first Christmas approached, we were so excited that she might be home for it. We were bitterly disappointed when, on Christmas Eve, she got a temperature and ended up in hospital. In April 2007, just when things seemed to be running a little more smoothly, Rose became very, very sick. An assumed infection worsened dramatically. Rose was transported back to Great Ormond Street Hospital from Kingston hospital. She had more tubes put down her nose and mouth and was given help to breathe during the transfer. She ended up in intensive care on life-support. Rose had developed a fungal infection which can be a side effect of chemotherapy. All her medication was stopped and we prayed that she would recover. It was a long, slow battle, but Rose fought her way back. She had lost so much weight. In the hospital we had to reintroduce tiny amounts of fluids and eventually food. We also had to try to help her to develop ‘normally’, learning to walk and play! For a long time Rose continued on a concoction of medication and feeds through her naso-gastric tube, which went into her stomach via her nose. We never got used to giving Rose this amount of medication. We never stopped thinking of the damage it could be doing as well as the hope of curing her it offered. 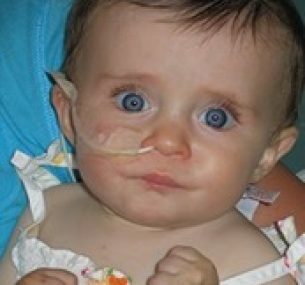 Rose finished her treatment on 14 July 2008 and she had her Hickman line removed two weeks later. We cherish every moment with her and pray for her continued good health. We also think of the other ‘little Roses’ who have not been so lucky and hope for a better cure in the future. “In July 2013, Rose reached five years since treatment ended – a huge hurdle which, once upon a time, we could barely dream of. When I look at her now; a lively, funny, healthy little seven year old, it is almost impossible to imagine everything Rose has been through and survived! Each time I see her take part in a school assembly, a tap or ballet show or simply playing with her big sister or school friends I am filled with amazement and huge gratitude to all the people who helped her to reach this point. Every step she makes is magnificent! We have watched Rose go through so many treatments, be so very ill and frail. We have waited with baited breath every time she had another infection to see whether this time this was it, we would lose her. So now, inevitably, there remains a gaping hole where our confidence and complacency used to be. It is a scar which I now realise we shall carry in our own ways for the rest of our lives. However, all these feelings pale into insignificance when I look at her and watch her grow up, unaware of the gravity of her illness and the huge mountain which she has climbed already. We are so hugely grateful to Children with Cancer UK for the incredible work they do for children such as Rose. It is thanks to them that there were new medicines and protocols in place to treat Rose. 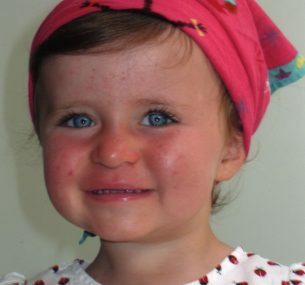 We are also aware that Rose is still very much one of the lucky ones as survival rates for infant acute lymphoblastic leukaemia remain relatively low. That is why we feel compelled to do more; to give something back in an attempt to show a tiny fraction of our gratitude and to try to give a little more hope to the children diagnosed with cancer and leukaemia and their families. 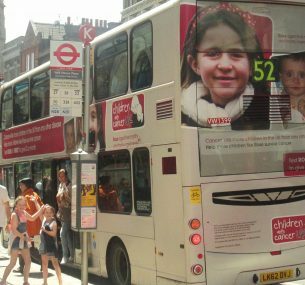 In 2009 my husband and I set up a charitable organisation called Rose’s Gift which supports Children with Cancer UK and Great Ormond Street Hospital. We held our third Rose’s Gift Ball. So far we have raised in excess of £150, 000 and we are determined to keep going! No amount of money we can raise will ever be enough to show how grateful we are to still have Rose, but we hope that it will help Children with Cancer UK to fund projects and improve the treatments and outlook for children diagnosed with cancer and leukaemia. Rose has gone from strength to strength and is now a very lovely, healthy 11-year-old. It is almost impossible to imagine everything she has been through and survived. She dances, she plays netball, she sings in her school choir, she was even made head girl in her final year at primary school. 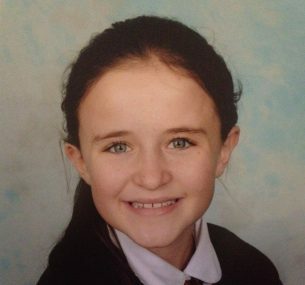 And this September she started secondary school – something that once upon a time we could have only dreamt of. Rose is a source of constant joy and pride to all of us. She fills our home with love and so much laughter. We cannot begin to say how grateful we are to Children with Cancer UK for the part they have played in Rose’s recovery, but we are determined to keep supporting them and fundraising for them…please do the same if you can.